Over the weekend, Cult of Mac revealed details of an Apple patent that would make texting and walking a little safer. The idea behind the patent was that a live feed from your camera could be piped through to the background of your texts, so you can see if something dangerous, like maybe a road or a cliff, is coming up. Granted it’s not a fail-safe method and you might see something hazardous after it’s a little too late, but text-related injuries are allegedly on the rise and we’re clearly not capable of putting down our phones, so surely any crazy idea is worth the punt? Well, it seems Apple’s patent application really inspired some developers, because if you’re impatient and can’t wait for the tech giant to introduce this new kinda of transparent texting into its devices then you’re in luck. Those that are feeling daring can now jailbreak their phones (don’t do this unless you’re really serious about it) and get a tweak called CamText, which automatically replaces the default background in Messages with a live stream of their camera’s video feed. 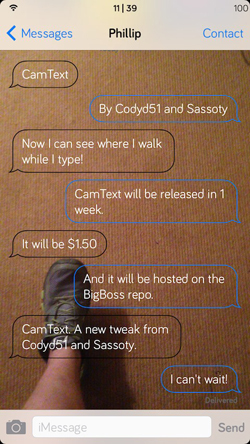 According to iClarify, the CamText app will soon be available from Cydia (the jailbreak app store) for $1.50.